It can not get any easier than this. Choose the amount of gift certificate you would like to purchase. Typical initial home cleanings are $250-$350. Purchase as many gift cards as you need, easily with secure credit, debit, or PayPal. 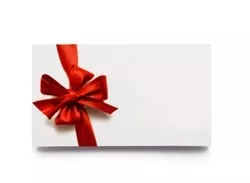 We are available to mail or hand deliver all gift certificates to either the purchaser or gift receiver at your request. The Lucky ‘giftee’ will have one quick phone call/email to make and we will handle the rest. The incredible gift of time saved and a sparkling clean home! Contact us to order gift cards of any amount you wish!